Amal Ibrahim, a housewife living in the Yemeni capital Sana'a, has to contend with power cuts that have become a daily occurrence since the protests and consequent political crisis began in the Arabian Peninsula country earlier this year. “I am unable to do my household chores such as cooking and washing as an electricity outage can last for 22 hours a day,” she told dpa. “This reminds me of the hard life in the early 1980s when housewives used to do housework manually for there were no electric appliances,” Ibrahim adds. Millions of Yemenis have taken to the streets since February demanding an end to President Ali Abdullah Saleh's 33-year rule. The crisis has recently turned violent with clashes, frequently resulting in deaths, between forces loyal to Saleh and his rivals becoming more frequent in Sana'a. Before the eruption of the anti-Saleh uprising, residents in Sana'a say the electricity supply was erratic but not as bad as it is now. “I miss those days when electricity used to be cut off for only four to five hours a day,” says Mohammed Abdullah, who runs a furniture workshop in Sana'a.Due to the frequent power blackouts, Mohammed says he cannot meet orders from his customers on time. “I have bought an electricity generator so that I can do my job,” he says. But he is facing another problem: a shortage of diesel fuel necessary for operating his generator. “Diesel is not available in Sana'a. I have to go outside the capital to get it at prices, which are at least twice as high as before,” he says. Work at the International Bank of Yemen in Sana'a has also been negatively affected by the lack of electricity, according to employee Basim al-Bahri. “Worse, we sometimes run out of diesel fuel for generators used by the bank,” he adds. The International Committee of the Red Cross (ICRC) said on Friday that essential services such as healthcare, electricity, water and education have been deeply disrupted, if not suspended, in Sana'a due to violence.“Over the past few weeks, there has rarely been a moment of calm in Sana'a,” the ICRC said. “For everyone, it is difficult if not impossible to move about within the city, which is filled with armed men, checkpoints and roadblocks,” said Eric Marclay, the head of the ICRC delegation in Yemen. 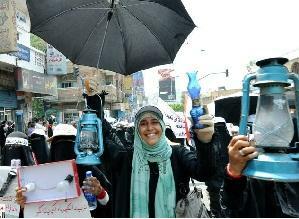 Here is a clip of a peaceful demonstration to protest against the power cuts in Yemen. They are chanting "Shame shame, there is no electricity day and night!"